using the voices of real children. In December of 1965 I was in a stone cold funk. I had just broken up with my girlfriend, was in the doghouse with my mother, and was having a helluva time in chemistry class. I was 16 years old, in the full bloom of adolescent angst. At that time in my life I felt perpetually disconnected, especially during the holiday season. After my father died Christmas was never the same for our little family. By 1965 our once big extended family Christmas gathering had splintered and what had been a highly anticipated event was reduced to something small and less than joyful. We now celebrated Christmas alone. It was a sad affair. Indeed, Charlie’s sad little Christmas tree mirrored my own heart. When I sat down to watch A Charlie Brown Christmas I was expecting to see something to which I couldn’t relate. I expected the show to be a bouncy, upbeat affair along the lines of Burl Ives’s Holly, Jolly Christmas. I expected to see happy people with joyous holiday feelings — feelings which felt completely foreign to me at the time. I discovered something quite different! 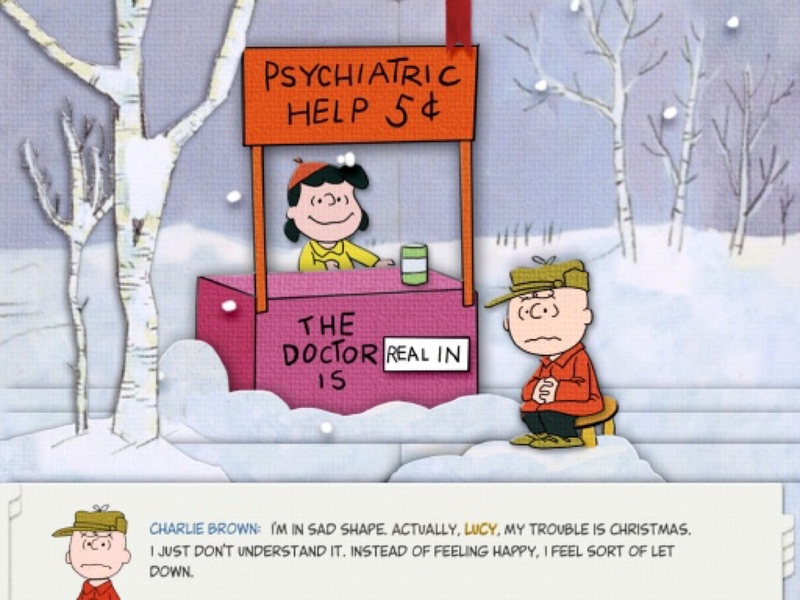 I discovered that Charlie Brown’s Christmas was perfectly in sync with my own. were not all that out of the ordinary. The story opened my eyes to the fact that many people experienced the chasm between what we would LIKE life to be and how we ACTUALLY experienced it. Charlie Brown shared an emotional honesty I found both redemptive and healing. Charlie helped me understand the important truth that life is hard in its own unique way for all of us, that no one escapes pain and suffering. Knowing that others are experiencing what I’m experiencing, and sharing those experiences, makes all the difference in the world. I have realized that my expectations for how things should be often get in my way, and actually create suffering. And slowly, over time, I have learned, as Charlie Brown did, that I have all that I need in my own imperfect life, just as it is. 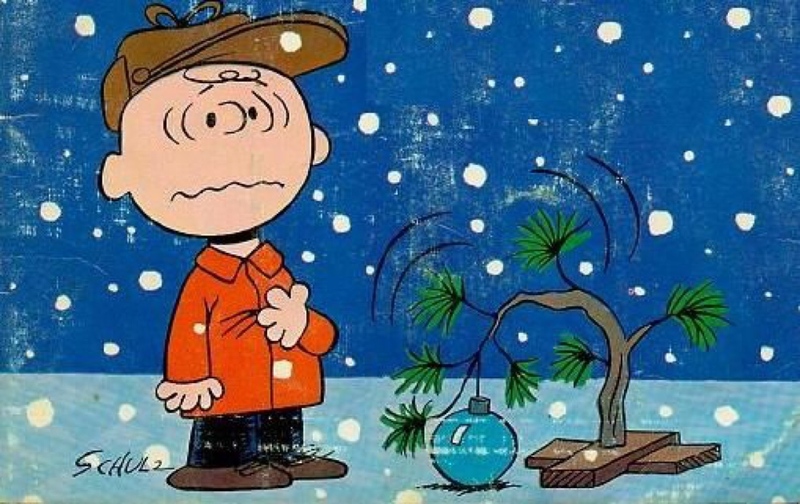 So, for the past 50-plus years I’ve tried to celebrate Christmas in a Charlie Brown kind of way. If you would like to submit a post to Just A Thought, please contact Marsha at mhahn013@sbcglobal.net. Copyright © 2016 Patrick J. Moriarty. All Rights Reserved. As we drove north today to visit grandchildren, we listened to Vince G. and discussed whether he ever knew how big an impact his music had. Of course it stays strong, and we talked about Peanuts and its message. How lovely to open this late Christmas evening and read this. Thank you, friend. What an insight. As a kid I never saw any value in Charlie Brown or Winnie the Pooh. They were the product of sissies to me. But in recent years the lessons taught by their creators are becoming more and more evident. I loved this reflection. I’ve been thinking how much Christmas/holiday season must accentuate loneliness for so many people! 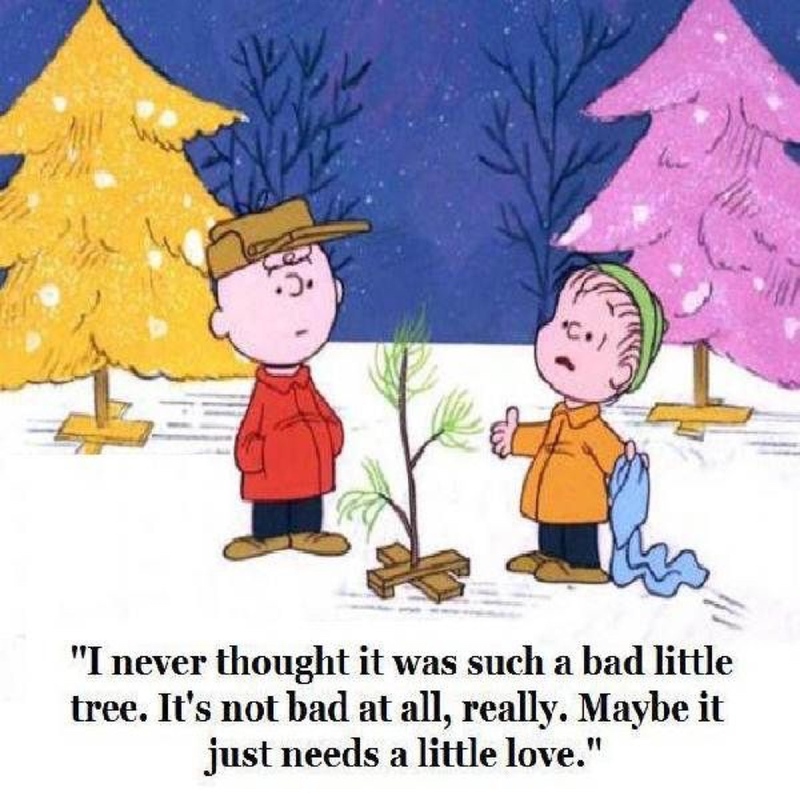 I never connected the dots to the affirmation of Charlie Brown’s emotional honesty and that beautifully broken Christmas tree! Plus, that was the first time I ever heard jazz and I recall just craving more. Of course, back then, i had to wait 12 months to see it again!